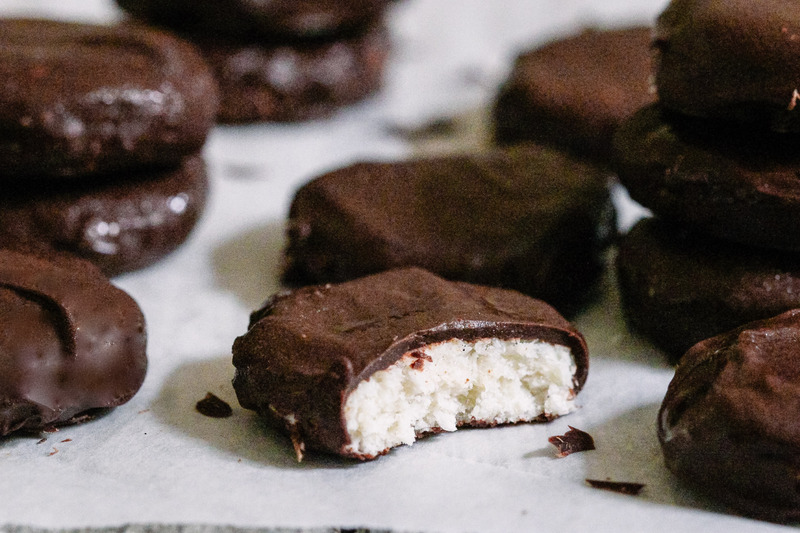 Peppermint Patties were one of my favourite treats when I was little, I used to love when my mom would bring them home from the states around Christmas time. 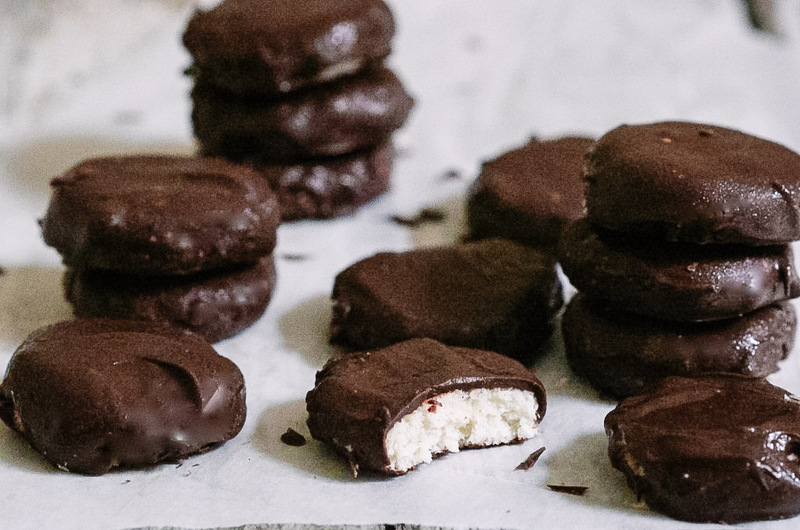 My version are so simple to make- just some gorgeous coconut, some maple syrup and a little peppermint extract wrapped in rich dark chocolate. They’re the perfect festive mouthful and so satisfying, they’re something I really crave! Scoop 4 tablespoons of coconut cream from the top of the tin of coconut milk (keep the rest for something else) and add it to your food processor with the desiccated coconut, maple syrup and peppermint extract. Blend on high for about a minute until soft. Lay some parchment paper out on a chopping board. Use your hands to roll the mixture into little balls (about half the size of the average energy ball) and then press them into discs on the parchment paper. Pop them in the freezer while you melt the chocolate. When the chocolate is melted dip each disc into the chocolate to coat, shaking off any excess. Pop them back in the freezer to set. When they’re hard, they’re ready to eat. Store in the fridge. Hi Indy, just wondering where you bought the peppermint extract? Have been trying to source it for a while now. I’m based in Dublin. The recipe looks amazing! Is that sweetened or unsweetened coconut? Hi Indy, lovely recipes as usual. Just wondering about blenders and what type you use? Was looking at vitamix and thermomix and was wondering what your thoughts are on these or if they are worth it? My basic kenwood is ready for the bin.